Typical migmatite rock. Photo courtesy of Etienne Médard. A heterogeneous silicate rock with properties of both igneous and metamorphic rocks. Typically, the rock contains alternating lighter layers (leucosomes, comprised of light-colored minerals such as quartz, feldspar, and muscovite) and darker layers (melanosomes, comprised of dark-colored minerals such as amphibole and biotite). The heterogeneous nature of the rock results from partial melting (called anatexis) that occurs when a precursor rock is exposed to high pressures and temperatures. The light-colored layers originate from the partial melting and have igneous characteristics– that is, their appearance indicates that they have been crystallized from a melt. The dark-colored layers have experienced metamorphism, but they do not have igneous characteristics. The distinctive light-and-dark banding (similar to that seen in gneiss) as well as the folding commonly found in this rock results from the partial melting as well as from high-grade metamorphism and deformation. The heterogeneous nature of this rock occurs on a wide range of scales, from microscopic (seen on thin sections) to intermediate (within a hand sample) to very large (only observable on a large outcrop). The word “migmatite” was first introduced into the geologic literature in 1907 by Jakob Johannes Sederholm and literally means “mixed rock,” originating from ancient Greek. Migmatites are truly extraordinary rocks. They are very beautiful rocks to observe in the field or in hand sample. They usually consist of dramatic alternating black-and-white layers, and I like to call them “Zebra rocks.” These alternating layers usually undulate in a serpentine fashion, often containing beautiful, sinuous, ptygmatic folds. Tight folds in a migmatite boulder (called "Bob's Rock") on display in the Grassy Hallow Visitor's Center, Angeles National Forest, California. Photo courtesy of Tisha Irwin. Another view of the "Bob's Rock" migmatite boulder. Photo courtesy of Tisha Irwin. As a quick aside, the word “ptygmatic” was also introduced into the geological literature by Jakob Johannes Sederholm in 1907 and originates from the ancient Greek word for “fold” or “anything folded.” In a way, using the term “ptygmatic fold” is somewhat redundant– like saying “a folded fold.” However, the term “ptygmatic” in the geologic literature generally refers to tight folds that form when the folded material has a greater viscosity (resistance to flow) than the surrounding medium. In migmatites, ptygmatic folds often form in the more-viscous lighter layers. Pink (K-feldspar-rich) ptygmatic folds. Photo taken from Wikipedia Commons here: http://en.wikipedia.org/wiki/File:Ptigmatite.jpg. Photo credit: Siim Sepp. Ptygamtic folds, a screenshot from part of the migmatite Gigapan by Callan Bentley. See end of post for a link to the Gigapan. Beauty aside, migmaties are also extraordinary rocks because they form at the boundary between the metamorphic and igneous worlds. As a quick reminder for those of you who are a little rusty on Geology 101, metamorphic rocks are rocks which deform at very high pressures and temperatures and which may recrystallize but which have not formed through melting. Igneous rocks, on the other hand, are rocks which form by cooling from completely molten material. Migmatites are hybrid rocks: the dark layers (most often composed of biotite and amphibole) experienced metamorphic changes, but did not melt. The light layers (most often granitic in composition; as a reminder, granite consists of the minerals quartz, feldspar, and muscovite), on the other hand, crystallized from partial melts of the precursor rock. A quick look at Bowen’s Reaction Series, which (in a very general way) organizes the order in which minerals melt (coldest to hottest) or crystallize (follow the diagram the opposite way, from hottest to coldest), gives a sense of why dark-colored minerals such as amphibole and biotite are more resistant to melting than light-colored minerals such as quartz, k-feldspar (often light pink in color), and muscovite. Generally, the light-colored minerals melt at lower temperatures than the dark-colored minerals. Bowen's Reaction Series. Image taken from here: http://www.eoearth.org/article/Igneous_rock. Partial melting of a rock to form a felsic (generally, light-colored) melt and a mafic (generally, dark-colored) residue. Image courtesy of Callan Bentley. The above figure refers to “felsic” melt and “mafic” residue. Felsic melts are silica-rich and form from silica-rich, generally light-colored mineral such as quartz and k-feldspar. Mafic melts are silica-poor (relative to felsic melts) and form from minerals with lower silicon contents such as olivine, pyroxene, and amphibole. Mafic minerals are generally darker in color, often black, brown, or dark green. Migmatites actually look very similar to a related rock: gneiss. Gneisses also contain alternating light and dark layers which result under high-pressure and high-temperature conditions. However, in a strict definition gneisses are metamorphic rocks, which means that the light bands form through recrystallization alone; the light layers did not form by cooling from a melt. Distinguishing between gneisses and migmatites can be slightly challenging to do in the field. The two rock types are certainly relatives, so to speak. If a gneiss experiences just slightly higher temperatures, it may partially melt and become a migmatite. Most migmatites probably were gneisses on their way to becoming true hybrid metamorphic-igneous (metagneous? ignamorphic?) rocks. Because migmatites are hybrid metamorphic-igneous rocks , they are important rocks for geologists to study in order to better understand how rocks melt and how these melts migrate and eventually become igneous rocks. Because many migmatites are silica-rich, some geologists have tried studying migmatites as a way to understand another silica-rich rock: igneous granite. For a long time, the origin of granitic rocks was debated by geologists. Between the 1920s and the 1960s, many geologists argued that granites could form from sedimentary or other non-granitic rocks through chemical alteration caused by fluids. This theory has now been largely abandoned, and geologists now believe that granites crystallize from melts of high-grade metamorphic rocks. The precursors of these high-grade metamorphic rocks may be either igneous (I-Type Granite) or sedimentary (S-Type Granite). Geologists now understand that granitic melts can form through a variety of melting processes. The presence of migmatites was one line of evidence that geologists examined to determine that granites probably formed through melting processes, not through chemical alteration processes. The exact relationship– if any– between migmatites and large bodies of melt is ambiguous and still debated amongst geologists, but migmatites do provide clear evidence that granitic melts (and also other types of melts) can be produced through partial melting of metamorphic rocks. 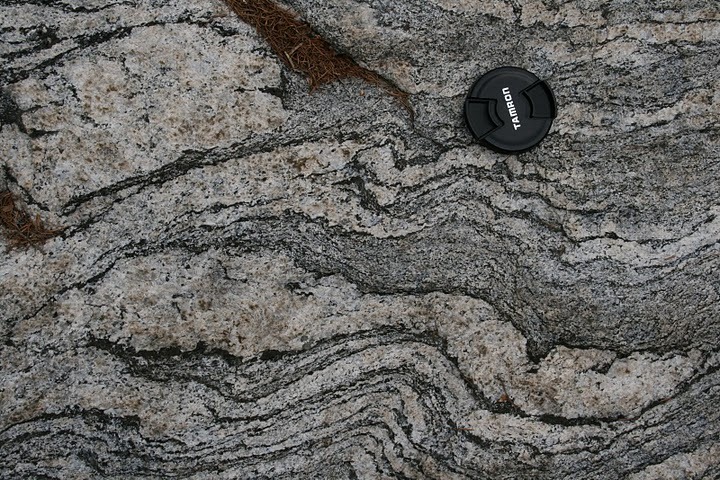 Some migmatites are even found in close proximity to granite, such as in the photo below. Adjacent granite and migmatite. Photo courtesy of Callan Bentley. Below are a few more pictures of gorgeous migmatite rocks. Enjoy! Close view of sinuous migmatite layers. Photo courtesy of Etienne Médard. Light-colored melt layers have aggregated in the center of this migmatite. Photo courtesy of Etienne Médard. Fine bands of light and dark minerals in migmatite. Photo courtesy of Etienne Médard. Sharp folds in migmagtite. Photo courtesy of Etienne Médard. More migmatite layers and folds. Photo courtesy of Etienne Médard. Gorgeous migmatite observed along the Billy Goat Trail, Maryland. Photo courtesy of Callan Bentley. Another migmatite observed along the Billy Goat Trail. Photo courtesy of Callan Bentley. Tight folding in migmatite. Photo courtesy of Callan Bentley. Gorgeous migmatite hand sample photographed in the lab. Photo courtesy of Callan Bentley. Migmatite boulder from the Skykomish River near Gold Bar, Washington State. Photo courtesy of Dana Hunter. A closer view of the above migmatite boulder. Photo courtesy of Dana Hunter. Another migmatite boulder from the Skykomish River. Photo courtesy of Dana Hunter. Closer view of the above migmatite boulder. Photo courtesy of Dana Hunter. Finally, here’s a link to a fantastic migmatite gigapan, courtesy of Callan Bentley. 1. Hall, Anthony. Igneous Petrology. New York: John Wiley & Sons, Inc. : 1995. 2. “migmatite, n.” The Oxford English Dictionary. 2nd ed. 1989. OED Online. Oxford University Press. 28 August 2011. 3. “ptygmatic, adj.” The Oxford English Dictionary. 2nd ed. 1989. OED Online. Oxford University Press. 28 August 2011. Awesome post! The pictures were especially drool worthy. I’ve seen plenty of migmatite rocks on a riverbed near me. I first noticed them while fishing their a few years ago. I might have to go back now and take a sample. Thank for the clarification: I had been under the impression that migmatites were just the magmatic/igneous component. It sort of makes better sense to me to have it as the whole-rock name. Also glad to hear concept of granitization has been largely dropped. I was always a little skeptical of that idea. Thanks for the cool link! and thanks for the Adk. series of pans. Small world; Donna and I were there in 2005 when I shot a lower-res pan to show the geological mixed-colors by walking along the road. But, could you be a mudlogger? Just kidding! I REALLY like your posts and I’m going to recommend it to my younger geology friends (just out of undergrad from Lafayette College). The mudlogger comment is because sample identification in that field is fast, like “Sandstone, White, md hd, with Ls mtx, tr sltstn. Do any research cruising? I was on the R/V Eastward, in ’77 as a scientific crew member while finishing my M.S. at Rutgers. The cruise info lost, it seems, perhaps because we were crusing off Noriega’s Panama. Again, thanks for your posts! i was in the field 2 months ago, and the migmatites were a real beauty, i always sat on one large outcrop while having lunch. thanx for that “folded fold” insight about ptygmatic folds. Here’s an alternative model for the origin of metamorphic rock and its isoclinal folds. On high gravity body like earth, aqueously-precipitated (authigenic) mineral-grains are clay sized, but in the low-gravity setting in the center of an Oort-cloud comet ocean from the early solar system, authigenic mineral grains would be thousands of times larger, i.e. gneiss and migmatite sized. Then during diagenesis and lithification as the water is squeezed out of the sedimentary layers, the comet core shrinks in volume, and the corresponding decrease in circuference results in ‘circumferential folding’, i.e. isoclinal folding. Circumferential folding doesn’t occur in sedimentary rock on earth because of its comparatively-vast circumference. I am a BSc Student from Myanmar. Thank you for very useful photos. I am an elementary student and am doing a report on migmatite. Do you know what it smells and feels like? Thank you! What a great idea of featuring variable structual patterns exhibited by “M”. Each of such structural patterns speak volumes of their evolution. However I will call some of the rocks in the plates courtesy Etienne Medard gneisses, cos of their distinctive alternating light and dark bandings. Many Thanks. Great post. Discovered it thru Linked-In. Thanks! I am a 4th year undergraduate student from IIT Roorkee (India) working on Himalayan migmatites. I was wondering if anyone could help me find researchers in Germany who are working on migmatites? I’m a university student of Geology in Korea. I want to know the process of Adjacent granite and migmatite. Can you teach me about that formation? Really a great post. I am a college teacher in Guwahati, Assam (India). I am very interested to do a systematic study of the migmatites present in my area. Would you like like to help me due to which i will be able to do the study properly. A strong link between gneiss and migmatites, agreed. What about felsic veining in ancient, variably matamorphosed sandstones/ mudstones in my stamping ground (west coast, South Island, New Zealand)? Where is the divide between that veined sedimentary stone and gneiss/ migmatite? Perhaps the local interpretation of “veining” should lean more towards gneiss/ migmatite – a fresh look at that stone is now in order for me – thanks for the education – better than any textbook I have read. Very interesting, nicely written and lovely images. Thanks very much for the post.